As of my last RR, my next scheduled race was the 10K in June. However, I got to reading old posts on the board and came across the discussion of prime13’s streak of running in an event every month for 10 years. Now, I’ve got no crazy illusions that I’ll ever have a streak like that – but if I didn’t run something in May then I’d have removed the option, which was bad. So I looked, and this 5k was about 15 minutes from the house. Done and done. Pardon the negativity here. It rained this morning, so that sucked. The course was more difficult than I expected – an out-and-back with a loop at the end, and it sure seemed like we spent more time going uphill than downhill for an out-and-back. So that sucked. My training runs had been going very well – almost smooth – but, alas, ‘twas not to be today. My legs felt dead all morning. So that sucked. And the visual clock wasn’t working at the finish line, so I had no idea how I did until I got home and was able to look online. So that sucked. In general, this one sucked more than the others. BUT … I PR’d by right at 40 seconds, so THAT’S good. I’m happy with progress, that’s for sure. I’m scheduled for my long run tomorrow on the ramp up to the 10K, and I imagine I’ll be doing it pretty slow based on the way I feel right now. And it was cool to get my mileage in on a rainy Saturday in a race, not just slogging through a soggy solo run. So, I’m happy with it, and I’ll be putting all of that negativity behind me. 1. Really good SWAG for a local $20 5k. Technical shirt, nice water bottle, actually useful coupons – was happy with that. And nice food spread, too – oranges, bananas, yogurt, pastries, bagels, muffins, danishes … good stuff. 2. A lot of the runners were employees at the hospital that was putting on the race, and they had made the race packet pickup available starting Wednesday of this week – so there were a lot of people wearing the race shirt. Which wouldn’t have stood out so much except that these shirts are probably the brightest fluorescent orange I’ve seen in a long time. Just stunningly orange. There was no missing people ahead of us making turns. 3. 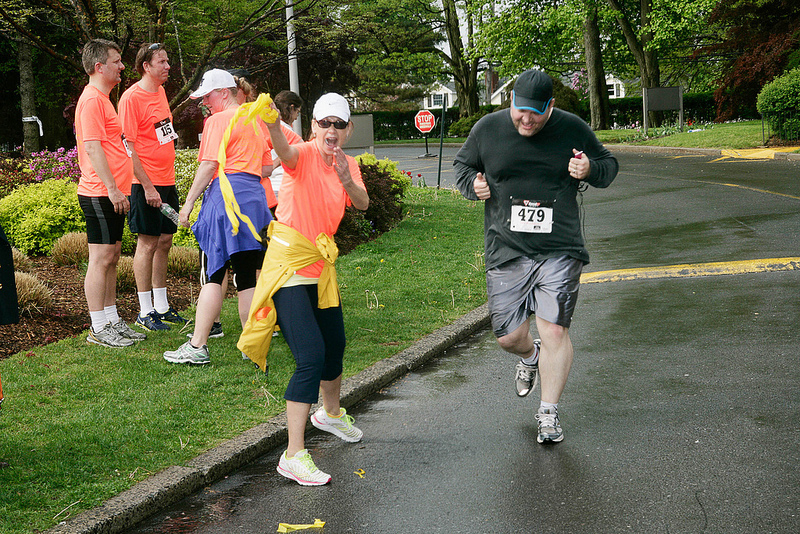 Designated people at the finish line to yell and “whoo” and say “great job” are awesome. They help. 4. I’m already signed up for races for June, August, September, and October – and I’ve got my eye on a 4K (automatic PR!) in July – so my streak should get to at least 8 straight months. So it begins. Next up, for real this time: Phillips 10K Trail Run / Walk.